But Friday’s jobs news isn’t all good. The government’s broadest measure of labor underutilization, known as the U-6 rate, jumped to 14.3% in June from 13.8% in May. 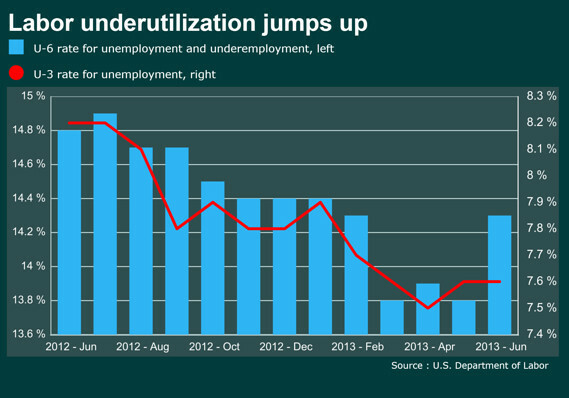 In addition to measuring the unemployed, the U-6 includes workers such as those who are underemployed and discouraged. Meanwhile, the headline unemployment rate, also known as the U-3, remained at 7.6%. The Federal Reserve has said it would keep rates close to zero while the U-3 rate remains above 6.5%.